Reduced energy consumption for mining operations is a desirable goal, however understanding the opportunities for optimizing energy consumption is not always clear. The Sankey diagram, which has been used for over 100 years to visualize the flow of energy, materials, or cost through various processes provides an option, but there are drawbacks to this approach: i) the picture presented is static, offering no way to visualize how energy flows vary in time, ii) the picture presented ignores spatial relations between the components it describes; energy that might be wasted at a particular location, could be used at another, if the latter was in range, but if the usage location is remote from the source, the opportunity must be reprioritized. To develop an application to augment the Sankey diagram with a 4D spatio-temporal visualization capability that supports decision-making relating to energy flows and usage by mine operators. A new energy flow visualization technique called Sankey Trees has been developed. 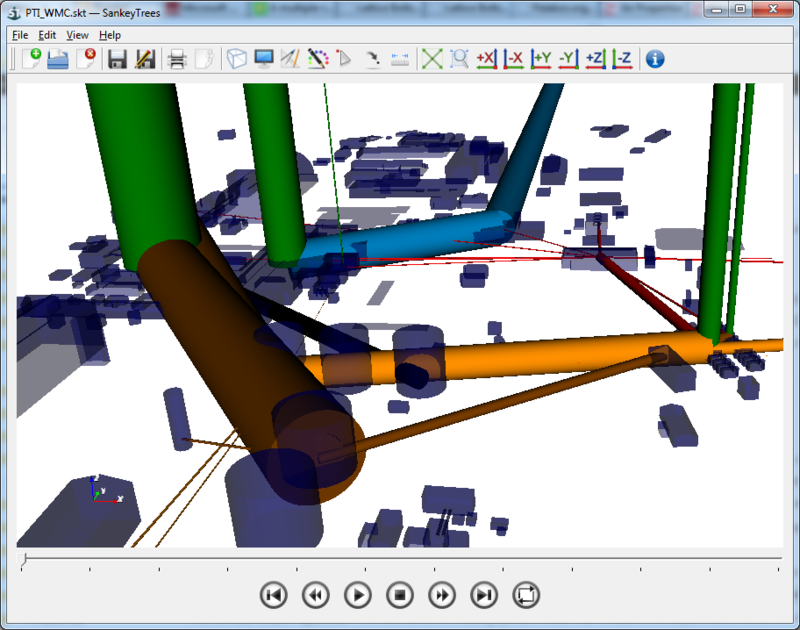 Sankey Trees is an application for creating 4D visualizations of energy flows between processes. Process locations are defined within a 3D model of the site being studied, and the magnitude of the flow between each pair of processes considered is replaced with a time series. Sustained and diminishing flows are represented through a variation of geometric properties and are animated to indicate the direction of flow and its transportation from one form of energy to multiple processes. Sankey Trees is now available for download at http://www.mirarco.org. This work was developed with the framework of research projects for Smart Underground Monitoring and Integrated Technologies for Deep Mining (SUMIT).